If you will, please take a moment to read some of these touching testimonials from prisoners. In the relative peace and stability of our daily lives, it is easy to forget that people locked away inside of prisons are human beings with very real needs. 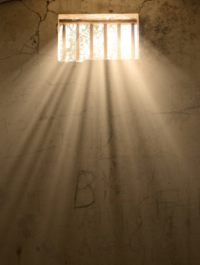 And many prisoners, being faced with their intense and challenging situation, are in deep need of support for their personal growth and spiritual awakening. A friend of mine wrote to you after finding your address on a prisoner resource list, but he has decided not to re-establish contact. However, I would like a copy of your Resource Directory. I should tell you, that I think what you do is very important (I loved your altar cards!) but I can’t afford to enclose any stamps. I hope that won’t keep you from sending the Resource Directory and any other dharma information. I’ve inherited all the info you sent to my friend (he says he worships ‘greed’ and, of course, dharma teachings cast ‘greed’ into a less flattering light). He said he did read through the package of teachings, so perhaps a worm – like a computer virus – has been introduced into his subconscious that will eventually change his mind. Man, Thanks! for everything. I received the whole package of stuff you sent me. I’m so grateful for all of this. I just got done reading this Resource Directory for Prisoners, and everything I could want is in there. I’m sure to make lots of contacts with like-minded people practicing. I’ll definitely add the Great Invocation practice into my daily practice. I can’t wait till tomorrow when our Sangha from the Streets come to practice, so I can share this with them. I have an idea that we read aloud the Noble Truths and the Noble Eightfold Path. These cards are great. I like the colors, texture and size. I understand you clearly here about what the Buddha said: Not so much that life is suffering, but that life is not capable of providing us with constant satisfaction for our never ending desires. Emphasis on our ‘desires,’ right? Neil, it means a lot and I commend you for providing this material for us on the inside. Thank you for the beautiful cards! This night could not be allowed to pass without the expression of my gratitude! What you are doing is beautiful. Don’t stop, your effort and action help to maintain the balance, adding a bit of light to one of the darkest places that I’ve had the breath to experience. I smile now, laugh at myself, for it took a place of darkness to put me on the path of light. Thank you for helping to light the way. After receiving your inspiring Dharma Teaching Altar Cards I want to share with you how much they have enriched my practice and further awakened me to the joy of unselfish compassionate service for the benefit of all sentient beings. Your efforts are used daily with appreciation and heart felt thanks. I also found your Resource Directory for Prisoners to be an up-to-date and comprehensive asset. I am so glad I responded to your announcement in the Buddhist Peace Fellowship’s Turning Wheel magazine. About a year ago I was looking through a newsletter I found in my dorm, and it had something about some free Dharma Cards. I didn’t even know what dharma was, but it said free, so I sent for them. Little did I know how they would affect me and become the pivot for changing my life. Thank you for the Dharma Teaching Altar Cards. I have really enjoyed the blessing. I pick a different card to read each morning before meditation. It has helped in keeping the dharma in my heart throughout the day. I wish I was a rich man so that I could offer all of my money to groups such as yours that so generously provide much assistance to those of us who are incarcerated. Unfortunately my financial situation is not the greatest, but I do want to send you this donation of $5.00. I realize that it’s not much, but, perhaps at a later date I can send more to help out. Thank your for the Dharma Teaching Altar Cards. I found them to be very inspiring and soothing to the soul. I appreciate the time and effort you put into making these teachings available for inmates to uplift and enlighten our hearts, minds, and souls. Please send me the Altar Cards. The Dharma Altar Cards, all three please. The Four Noble Truths, Eight Verses for Training the Mind, The Four Immeasurables. Thank you for this opportunity to get these cards. I’m a female inmate on death-row. I need as much spiritual, peaceful fulfillment and enrichment as I can get. Peace and thanks. I know for a fact, that persons who are imprisoned and who undertake forms of meditation oriented toward spiritual goals, are less likely to commit a serious crime and return to prison. They are also less likely to commit violent acts while imprisoned. On a personal basis, after long-term incarceration, I have clearly noticed these facts. Your service has helped by providing spiritual information to those perhaps most in need of it! It can change lives and does make a difference. I have put this off now for about a month out of embarrassment, sort of though technically I have nothing to be embarrassed about. These “fine” people here chose to assault me, and after they had their fun with their pepper spray, they then took my property. When I succeeded in finally getting it back I was missing a few things, such as all three of my Dharma Teaching Altar Cards. Every day I purposely read some or all of one or more of these cards as I had them taped to my wall to help remind me to not let the actions of others (adverse or otherwise) negatively effect my own actions. It’s not always easy, especially in this lovely dungeon, to keep a positive state of mind. But you best believe me, your cards at least help me to do so. I am sorry but…is it possible to oblige my request for another set of cards. This time I will keep them in their envelope “hidden away” and get them out each day as I specifically need or want to use and read them. Thank you so very much for sending multiple sets of the very beautiful Dharma Teaching Altar Cards. All of us greatly appreciate your generosity. Our group here now consists of six hungry students: five Tibetan and one Zen, studying and meditating together. One set of your lovely cards graces our altar at each meditation session. I put out my set each time I meditate in my cell. I wanted to let you know that the cards definitely touched my heart and are of great benefit. The Four Immeasurables, with the beautiful thangka of White Tara, I’ve found to be especially inspiring. Hello again, I did receive the three altar cards I requested from having seen your ad in Turning Wheel Journal and just wanted to let you know. The three cards are beautiful and I read them over and over again every day. Amazing truly, I feel so much better in my understanding and all from the Noble Eightfold Path I study. I have been showing the three cards to some of my friends and I told them I would ask you for a few more if you could send more for our little prayer group here in prison I’d really put them to good use. I’m doing a 25 to life sentence and I can’t find out what to do for my time to be easier…I would like to receive the collection of Altar Cards, “The Heart of Dharma.” Thank you. Thank you for your light in a dark place. I would like to thank you for sending me my Heart of Dharma Collection of Altar Cards. I have been using them in my morning exercise and prayer. The energy and vibrations are very noticeable. I read them, and study the meanings very carefully during my time with them. They have made such an impression to this point, that I just felt I needed to write and let you know. Greetings and peace to you. I am writing to request a card containing the Eight Verses for Training the Mind. To me, this is one of the most powerful pieces I have studied and practiced since I became a Buddhist. Thank you for offering this most precious gift. Thank you very much for the copies of the Eight Verses for Training the Mind. I was immediately amazed by the beauty of the picture and the beauty of the message. Mine is displayed where I will see it whenever I am in my cell. I have been down [in prison] since March 2000. But it is almost over now. God has blessed me with seeing this prison time as an opportunity. An opportunity to focus on spiritual studies, daily meditation, and spiritual growth. And now it’s almost time for me to carry all this “treasure” with me back out into the “free world.” I’m really looking forward to getting out and really living my life on the the right track. I give all the credit to God and I thank Him daily. I also thank you and others like you who reach out to us here behind bars who want to make a serious change in our lives. Your efforts are not in vain! Look at me! I’m not the same man who was arrested back in March 2000! And Thank God for that. And once again thank you for all your kindness. We keep a copy of this directory in the Re-Entry Manuals in our prison libraries in Washington State. It is one of the most frequently requested resources by inmates here. Thank you for continuing to update it and make it available. Thought you might be interested in the best story I have heard surrounding the Dharma Altar Cards you provide. There is one inmate in Marion Correctional Institute who reads a part of the card first thing each day just prior to meditation. Then he carries that thought around with him for the rest of the day. He has been in for 11 years and has 2 to go. He is most likely the strongest individual practitioner of the Dharma I know in prison. He attributes the Dharma card to being the single best thing that has enabled him to strengthen his practice to this point. It is a good thing, keep it up. My name is Patrick Brooks, I was incarcerated for two years, a little over three years ago. During that time I was introduced to the Buddhist path by a therapist in a voluntary Drug Treatment program. Before long I was very interested in Buddhism and mailed to several prison programs for books and materials. One of the programs I contacted was Naljor Prison Dharma Service. You responded by mailing me very easy to read and understand explanations of the Four Noble Truths and the Eightfold Path, as well as several beautiful prayer cards, which I proudly displayed in my cell. Since my release I have become involved with two different Sangha groups in my area, have stayed involved with my program, and have shared the benefits of the Buddha’s teaching in my speeches each Friday night to the men still in the program. I have a two month old baby girl, have remained at the same job, maintained sobriety (for the first time in my life), and have really become a totally different person. I am typing this letter to you from my living room, and when I look up I see five beautifully framed prayer cards that I have cherished since the day they arrived in mail call while I was still incarcerated. Buddhism has changed the course of my life. If it wasn’t for programs like yours, I would have never had the opportunity to get to know the teachings of the Buddha. Thank you and many blessings. My name is Mitchell Anderson and I am the Chaplain at the Greensville Correctional Center (GRCC) in Jarrat, Virginia. GRCC is the largest maximum security institution in Virginia with a total inmate population exceeding 3,000 men. Recently I wrote you on behalf of my men to request the donation of your Resource Directory and Glossary of Buddhist Terms. I was elated to receive the shipment of the requested materials in the mail that you so graciously transmitted to us. Your donation is phenomenal and most gracious. The resources are being made available to our general population. They are getting a lot of attention and use—from within and outside of our Buddhist community. I am sure they will indeed continue to be a blessing for my men and will continue to be wonderfully received. On behalf of my men, I want to thank you from the bottom of my heart for the donation. May God richly bless each person associated with your organization for the work that you do. You have not forgotten the prisoner and for that I am grateful. I am so happy to give a testimonial, as I think you are offering a wonderful gift in giving dharma teachings in such a beautiful presentation. You kindly gave me some of the Eight Verses dharma cards to pass out during my prison visits (as a CRA at Tucker Maximum Security Prison in Arkansas) and those who received them were thrilled. The dharma cards are now sitting on many, very touching, make-shift altars in their cells. The cards sit aside pictures of various Buddhas, flowers they picked in their yard calls that managed to survive in the dog-trot enclosures, and some sit beside pictures of Mother Theresa, Jesus, and their families. One can tell that the Eight Verses cards are among their most prized possessions. On another of my prison visitation days, one of my young group members – a boy who has been in prison since the age of 18, has multiple life sentences, and is now learning to meditate – came into the group showing everyone his dharma altar card that he had sent for. He was flushed with excitement and was so happy with the beauty and the message of the card. It is hard to imagine, that in a world [prison] where so little is beautiful and so few care about people, the incredible impact that such a gift has on people’s lives. Thank you for bringing joy and the seeds of liberation to so many. Your act of kind compassion touches more lives than you will ever know. In the harsh confines of prison, small personal spaces are created with these Dharma altar cards. What might appear to be small, means so much to Buddhist prisoners in their restrictive environment. I wish to thank you on behalf of Hongaku Jodo of America, and our nationwide prison ministry, for the wonderful cards you sent us to distribute to our incarcerated brothers and sisters. The Eight Verses for Training The Mind by Geshe Langri Tangpa has been well received. Thank you again for your kindness. Buddhist Inmate Sangha gets letters from the inmates who have received the Dharma Altar Cards…they love them. The Altar Cards bring beauty, peace, and a message to them which they share with others. Some inmates, who have group activities, use the Altar Cards as the center for their meditation and altars as they have no other focal object for the Buddha Image. Thank you again. My dear friend, when I heard that you have been sending the Heart of Dharma Collection of Altar Cards to prisoners who requested them, and that these folks were very thankful for your gift and the inspiration these teachings offer them, well I instantly wanted to participate in this service. I want to thank you for making these teachings available to people who might not have found them otherwise. I love the part of our human nature that wants to reach deeper into who we are. The part of us that wants to experience and share kindness, peace, and thoughtfulness within ourselves and with others. I feel the Eight Verses for Training the Mind can truly inspire and support this experience and remembrance of who we are. I thank you for your vision and action in reaching out to prisoners! Enclosed please find my contribution to help support your efforts.